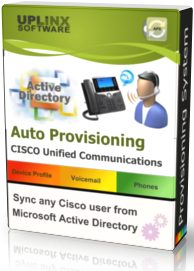 Any combination of phones, device profiles, Jabber, softphones, RDPs, presence and voicemail configurations, of all Cisco UC end-users, can be managed automatically by APS to configure all Cisco UC servers. Each end-user configuration is controlled by easily configurable rules that use the Active Directory configuration for each AD user. Location and user type information is read from attributes within the AD user configuration and thus can be pre-set by existing Active Directory management systems, during or after the Microsoft provisioning process. Maintaining the Cisco end-user’s configuration in Active Directory allows for 98% reduction in manual provisioning. The system also supports automated emails to end-users, including log-in details and training material. Cisco Extension Mobility and other softphone configurations are perfectly suited for Auto Provisioning. More in our white paper "Deployment of Cisco Extension Mobility in Enterprises".